Yesterday Euro made strong ascending movement, which may complete current correction. I’m selling again with stop above yesterday’s maximum. 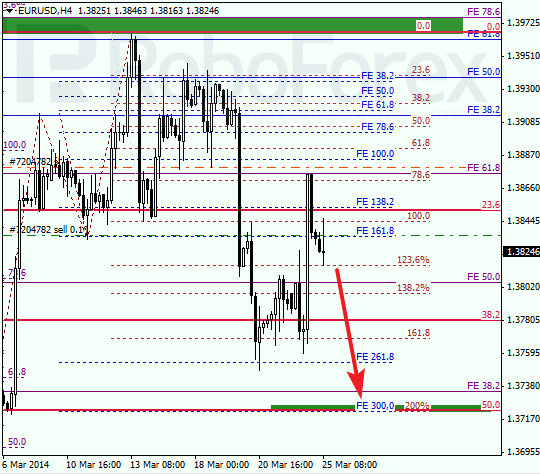 Target is still near several lower fibo-levels at 1.3725. As we can see at H1 chart, market was a bit shy to reach local correctional level of 61.8%. According to analysis of temporary fibo-zone, pair may reverse in the nearest future. I’ll move stop on my sell order into the black as soon as price reaches level of 1.38. Franc is also still being corrected. 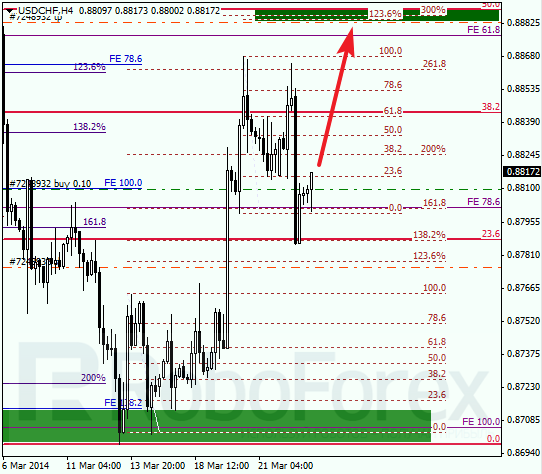 Target is still near level of 0.8890, where there are several more fibo-levels, that’s why I continue buying. Possibly, price may break maximum during Tuesday. At H1 chart, current correction reached level of 50% right inside temporary fibo-zone, which means that pair may reverse and start new ascending movement. In the future, I’m planning to increase my long position.